Falls has officially started and temperature is going down. With fall, comes holidays and lots of pretty holiday inspired nail arts. So, today's post is featuring my first holiday manicure this year and review of this beautiful "Holiday Series" stamping plate set from Ejiubas. 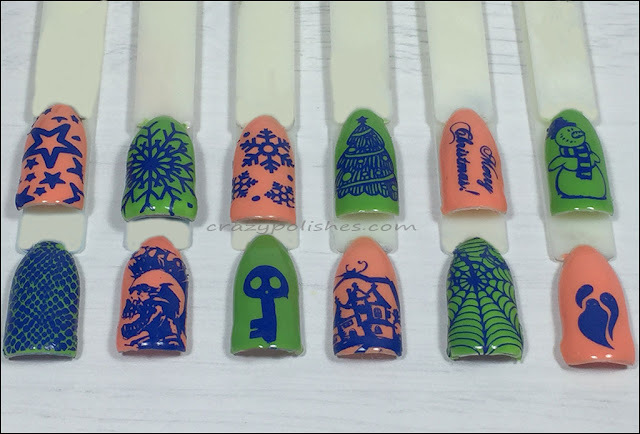 This Holiday set has 2 stamping plates one is Halloween themed(EJB-04) and another is Christmas theme(EJB-03) based. 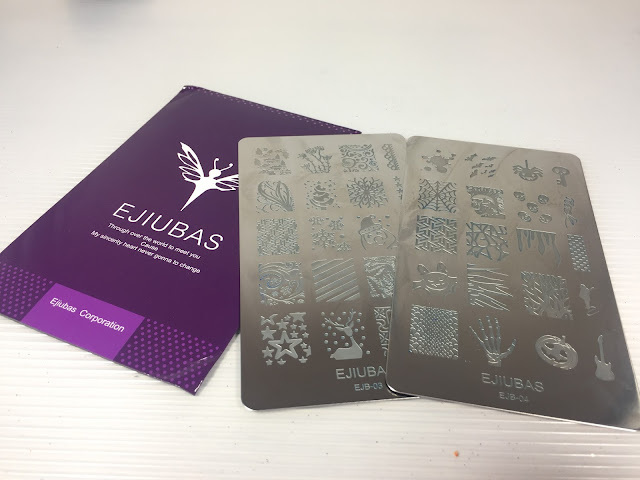 Like other Ejiubas stamping plates, both of these plates are etched on both side of the plates. Both the sides of plate is protected by a blue plastic film. One side has rectangular images and other side has buffet style images. The image size of rectangular images is 2.0x1.5cm(LxW). These stamps very beautifully with all details transferred seamlessly. I tried stamping images with two different stampers. Checkout the video review HERE. These are few sample swatches of the plates. Top row has swatches from EJB-03(first three images from side A which has rectangular images and last three are images from side B which has buffet style images). Bottom row has swatches from EJB-04(same type as mentioned for above plate). As you can see in the swatches they stamps beautifully. I did a halloween manicure using EJB-04. For the nail art, i used Nubar hot orange, and a layer of China Glaze fairy dust. Stamping polishes are konad special polish in black and white. Finally HK girl top coat.